Published on November 19, 2013 November 29, 2013 by Jennifer S.
We said our good byes-for-now to Jerusalem this morning and started our journey north. 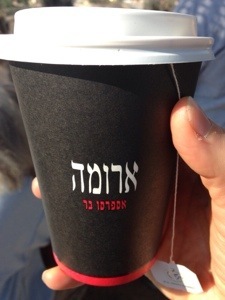 On our way, we stopped at Aroma, Israel’s Starbucks equivalent. The menu was available in Hebrew, English, and Russian, though I don’t think the guy behind the counter understood my Russian. 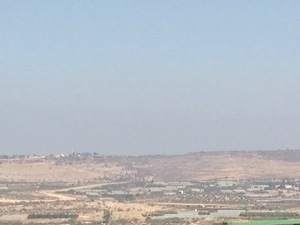 Our first stop was at a spot where you can see 20% of the land owned by Israel. We were briefed there by Dr. Avi Melamed, who was able to point to where the 1949 “green line” lies. He described how various settlements in view would be effected if those boundaries were put into use today. Among the other topics discussed were suicide bombers and the security fence. Though some portions are cement, most of the time the fence is just a fence. It is a fence, however, with one sophisticated security system. Basically, it has eyes in the back of its head. View of the 1949 Green Line, look for the dirt road. Back on the bus, we traveled to Moshav Nahalal. The moshav, which is similar to a kibbutz, began in 1921. Some of the original buildings still stand, which is an unusual period of architecture for the country. Within the moshave is a start up organic cosmetics company, Lavido. We started our tour sampling pecans that fell from the farm’s trees. Walking around the teaching farm (the company has grown and needs much more land), we were introduced to some of the herbs used to manufacture the products. Next they gave us the opportunity to make our own perfume using their essential oils. When I get home, come visit and I will let you try the lavender perfume. After a quick lunch stop, we arrived at a school in Afula. Afula is Greater Hartford’s sister city. Some of the money raised each year by the Federation, and sent to Israel, benefits this community. We started with a visit to a school. Divided into two groups, we learned about the programs put into place with Federation money. My group heard about the Fathers and Sons and Sport program and the community garden. Teachers and parents both spoke, and told us how participating in the programs has improved their relationships with their children. Next we drove over to Bernie [Waldman] Park and took a group photograph. Bernie and his wife, I have been told, were instrumental in the development of the sister city relationship. Across the street from the park is Beit Uri, a beautiful, residential campus for intellectually and physically disabled individuals. There are about 100 residents, and additional day students. The school offers several different types of therapy, including music and pet. Right after we arrived we got to sit in on a concert being performed by a trio from the Israeli Symphonic Orchestra. We were then treated to coffee and cakes prepared by the residents. During this time we had the opportunity to purchase craft items made by the residents. Additionally, the residents were presented with musical instruments handmade by teens in Hartford’s JT Connect program. All of the residents work, whether cooking, doing crafts, or caring for the animals. The animals used for therapy include goats, birds, and rabbits. One of the projects that the Hartford Federation has funded over the years is a bomb shelter. Bombs were nearby in 2006 and they actually had to make use of it. All I could think about while were at Beit Uri was my cousin, who lives in a Jewish Community Living home in West Hartford. Her home is much smaller than Beit Uri, but she has always been very happy there. The residents of Beit Uri also seem to enjoy their home. Additionally, they are very proud of the items they sell. Dinner tonight was with host families. My group of four went to the home of a professional chef! We ate falafel, pizza, and pasta, and chatted about our common interests. The chef’s assistant spent last year as an emissary in Westport, CT. Her English is fantastic, and she was able to translate as needed. Overall, the family seemed excited to have us over, and we all enjoyed the experience to hear what average Israelis have to say. 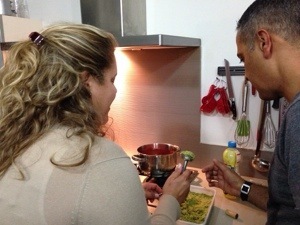 Emily Berman learns how to form falafel at our dinner in Afula. Today, like yesterday, was a very good day. It was good in a completely different way, though. Masada is beautiful, but so is hearing that your money has helped to improve relationships and to build lives. 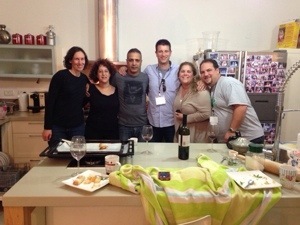 Myself, our Afula hosts, Scott MacGilpin, Emily Berman, and Todd Berman.